The Law Office of Peter M. Thall specializes in all areas of entertainment law, intellectual property, and intangible rights with particular emphasis in music, merchandising, sponsorship, endorsements, fashion, and photography. The Firm's clientele encompasses a wide variety of artists at the top of their professions, including both classical and popular-oriented recording artists and songwriters, producers, music and fashion industry executives, fashion models, photographers, and investors who acquire music publishing and master recording catalogues. We provide special counseling services to corporations seeking to comply with various global copyright and other intellectual property laws affecting their on-line presence. In particular, we provide general counsels of major, including public, corporations, with the ability to educate themselves and their company's ever-changing employees in the nuts and bolts of copyright law, including sampling, use of others master recordings and musical compositions in their corporate offices, in their special events, including DJ events, and on their various on-line ventures including their corporate websites and websites promoting their products. Senior attorney Peter M. Thall frequently lectures at industry and legal seminars regarding the Firm's practice areas and has been featured on local, regional, national, and international news and talk shows. His opinions are frequently sought by newspapers and magazines seeking comments on current events in the entertainment industry and seeking to uncover and understand trends. Among the print media in which Mr. Thall has been featured as an expert are Variety, Billboard, USA Today, the New York Times, The Wall Street Journal, Broadcasting Magazine, Music Business International, the American Bar Association Law Journals and the New York State Bar Association Law Journal. Among the broadcast media in which Mr. Thall has been featured as an expert are NBC, MSNBC, FOX and a host of radio stations throughout the world. Peter M. Thall is a veteran of more than 45 years of practicing law with a speciality in music law. Mr. Thall has represented many of the world's greatest artists from Simon & Garfunkel to Barry Manilow, Hall & Oates, The Average White Band, ABBA, The Cars, Foreigner, Pat Benatar and innumerable other bands, producers of such contemporary artists as Billy Joel, Weezer, Hole, Nada Serf, D Generation, Will Smith, Boyzone and Hansen and singer/songwriters from Ric Ocasek and James Taylor to the composer of Wicked and several Disney and Dreamworks animated features, Pop star Kiesza, Peter Cincotti, and corporations utilizing music such as Victoria's Secret, Express, Henri Bendel, and The Gucci Group. Crossing over into the classical music area, Mr. Thall represents a wide variety of instrumentalists, opera singers, conductors and performing ensembles, many of whom dominate their respective disciplines. His clients have included the renowned Soprano Anna Moffo, the world-famous violinist Hilary Hahn, and the avant-garde electronic string quartet ETHEL. Performing a somewhat different function, he took charge of the media responsibilities of The Papal Concert to Commemorate the Holocaust, broadcast to more than 52 countries live from the Vatican, which NBC News called one of the great success stories of the 20th Century. He was the Associate Producer of the highly acclaimed PBS Special based on the event, conceived and conducted by Maestro Gilbert Levine. Music Business transactions of all kinds; Copyright Law; Executive Employment Agreements and Compensation Agreements; Copyright Catalogue Valuation and Sale Agreements; Acquisitions and Mergers in the music publishing and recording fields; providing corporations with Copyright Compliance Services in their internet-related businesses. "ARTISTS AS CAPITAL: Eastern Europe Primed to Join Global Entertainment Scene"
"An American at Midem: Reflecting on IP Afterlife"
"Strategy: Management Development: A Prescription For Achieving Business Results in Central and Eastern Europe"
What They’ll Never Tell You About the Music Business, Third Edition: The Complete Guide for Musicians, Songwriters, Producers, Managers, Industry Executives, Attorneys, Investors, and Accountants [Watson-Guptill/Billboard Books, 2016] reveals what most savvy music executives already know - - and hope that readers never find out! It’s a digital world, but the fundamental realities of the music business remain the same. In What They’ll Never Tell You About the Music Business, Third Edition, Peter M. Thall, a specialist in entertainment and copyright law, takes an in-depth look at all facets of the music industry. From how artists can best maximize their chances for long-term financial health to what pitfalls to avoid when signing an industry employment contract, Thall discloses the hidden dynamics and unfortunate consequences of what really happens when a deal is prepared and contracts are signed. 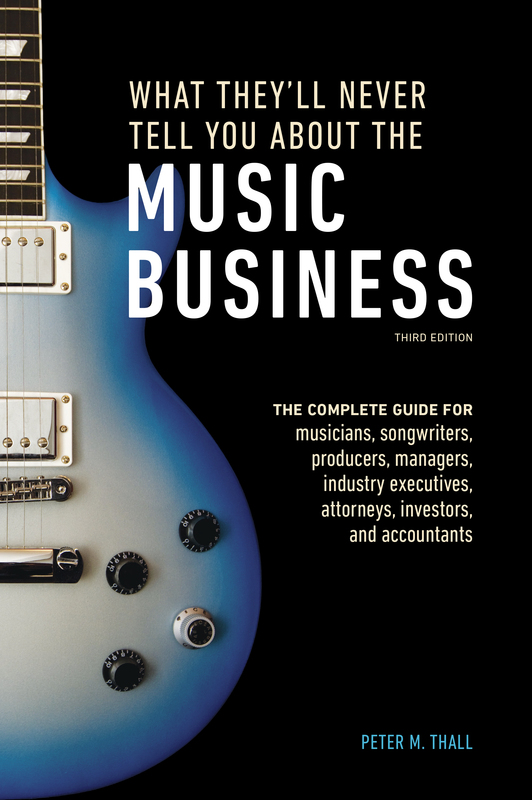 Completely revised and expanded to reflect both the economic and technological changes that the music industry has undergone over the past decade, What They’ll Never Tell You About the Music Business, Third Edition remains one of the most definitive sources for industry professionals. Evaluate copyright and sound recording catalogs in terms of ROI, and more. “This book gives you the real deal on the way the music business really works, whether you’re new to the game or even if you think you’re a veteran - - from contracts to touring, good and bad money decisions, and even creating a team no artists should do without.” - Sean Paul, Transformative Reggae and DanceHall Recording Artist. “For someone on the way up, this book is a must; for everyone else, it’s a bible.” - Danny Strick, co-president, SonyATV Music Publishing Inc.
“Attention Classical Musicians: This book is for you! In the rapidly changing world of the performing arts, it is more important than ever to understand fundamental business principles. This book explains it all - - and will save you a lot of time, aggravation, and money.” - Charles Letourneau, Former Senior Vice President IMG Artists; Artistic Consultant for Festival Napa Valley and Other Arts Organizations.